Jesse will tell you that I'm the queen of odd combinations - and I guess he's kind of right... but I'd tell you that I'm the queen of deliciously odd combinations - and this is one of those. Having so many allergies, I'm limited in what ingredients I can put together when I'm cooking for myself, so I often experiment with different flavour combinations and ingredients to keep things interesting. This quinoa pilaf was a bit of a bare fridge combination - I had limited ingredients but wanted to make something that was tasty and delicious so I threw together what we had and dug through our little herb garden to add an extra flavour boost. 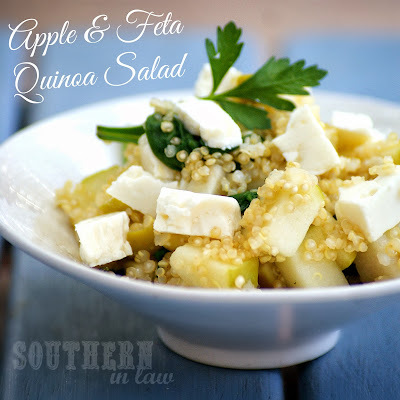 What I came up with was a delicious Warm Apple and Feta Quinoa Salad that was a huge hit in the SIL house - and so simple to make! If you're looking for a quick and easy meal, this is one for you - I'm not much of a meat eater so I'll eat this for dinner with a side salad, however, for Jesse I'll serve him up a smaller portion with some grilled steak or chicken. It'd also make a fantastic side dish for Thanksgiving or Christmas or anytime you're entertaining - just increase the recipe! In a saucepan over a medium heat, sautee your apples with a touch of boiling water until slightly softened. Add in your fresh herbs, garlic and spinach and sautee until wilted and garlic starts to brown slightly. Mix through your quinoa, seasoning with salt and pepper to taste. 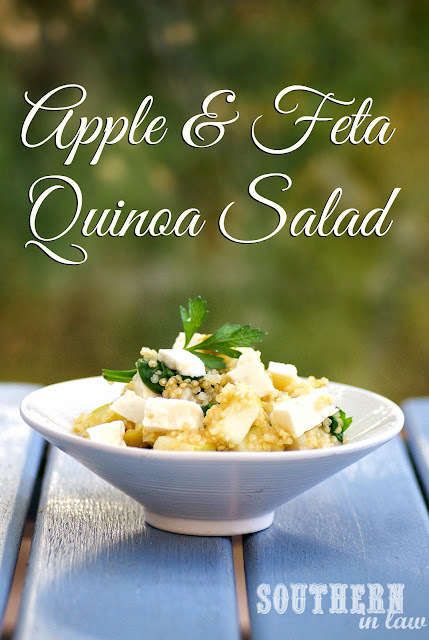 Stir through your feta, allowing to warm slightly before serving. *For the pictured version I used goat feta as that's what I had in the fridge, however, I also use cow's milk feta and it's perfect! Feel free to use whichever you like best. And there you have it, a simple but oh so delicious meal! But tell me, what's your favourite "odd" combination? I think apples and cheese are a pretty normal (and delicious) combination but it totally weirds Jesse out - but then again, he thinks I'm crazy for putting nut butters on top of sweet potatoes, cheese on top of rice or spinach in my smoothies. That is one of my favourite combinations, Angie! And it works really well with basil too!